This historically significant engine also features a two-stage supercharger and fuel injection. The Centaurus engine was used in WWII British Fighters and later in post war commercial prop driven airliners. This powerful 18 cylinder, two-row radial engine… made the Sea Fury one of the fastest piston-engine aircraft ever built. Continued from above… HP. Highly successful, it powered a number of warbirds and, later, civilian aircraft. In the 1930s Bristol developed a new line of radials based on the sleeve valve principle, which would develop into some of the most powerful piston engines in the world, and could continue to be sold into the 1950s. In 1956 the division was renamed Bristol Aero Engines, and then merged with Armstrong Siddeley in 1958 to form Bristol Siddeley as a part of the airframe mergers that formed BAC. In 1966 Bristol Siddeley merged with Rolls-Royce, leaving only one major aero-engine company in England, Rolls-Royce. 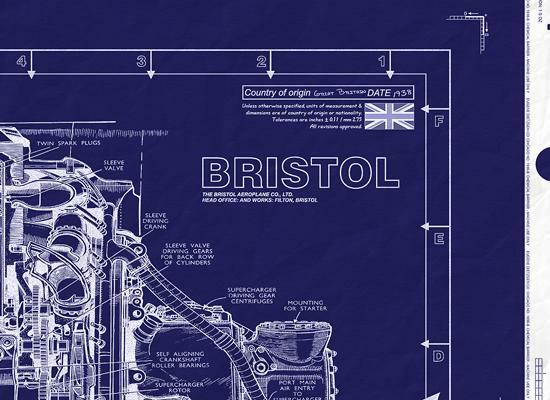 The Bristol Centaurus has 18 cylinders in two rows, and is a sleeve-valved radial air-cooled engine. The first version produced 2,000 bhp, and the most powerful variant produced 3,200 bhp. It was the ultimate radial engine, and was developed primarily for heavy bomber and transport aircraft. Over 8,000 were produced. The Centaurus radial engine made the Sea Fury one of the fastest piston-engine aircraft ever manufactured. The Centaurus powered the Hawker Tempest, Hawker Fury and Sea Fury, Airspeed Ambassador, Blackburn Beverley, Bristol Brigand and Vickers Warwick. 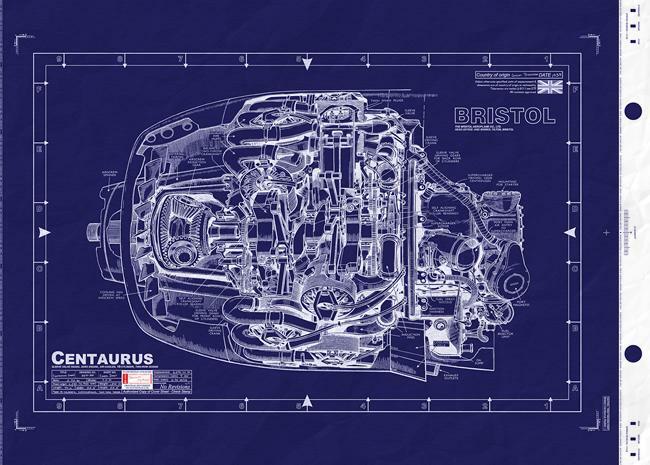 The Centaurus was also used on the Bristol Brabazon prototype, which had four pairs of 2,500 bhp Centaurus engines, each pair driving a set of contra-rotating propellers. The Bristol Centaurus is still used today to power many of the Furys that take part in 'Plylon-Racing' at Reno. The inset shows a Bristol Centaurus cylinder and its sleeve . Note the intake and exhaust ports in the sleeve. These ports were the secret to the sleeve valves extremely good volumetric efficiency. A ring with triangular inlet and outlet holes located around its circumference. This 'sleeve valve' would move via a mass of gearings between the cylinder wall and the piston. The gearing system comprised a vast number of cogs rotating behind the cylinder banks. As far back as 1926, the Bristol Aeroplane Co. foresaw the speed and load limitations which would eventually be met in high-performance engines which have push-rod operated over-head valves. The increasing seriousness of maintenance problems with this mechanism was also foreseen. With the encouragement and support of the British Air Ministry, the Company therefore decided to develop the single sleeve-valve. The first complete Bristol sleeve-valve engine, a nine-cylinder air-cooled radial of 24.9 liters capacity, was designed and built in 1932. It completed its official trials with great success soon afterwards. This was the Perseus. With further development it was the first sleeve-valve aero-engine in the World to be put into large quantity manufacture. The potential advantages of the sleeve-valve for high-output two-row radial engine design were also apparent. In 1936, the Bristol Hercules fourteen-cylinder radial sleeve-valve engine of 38.7 liters capacity appeared and this was followed by the Taurus, a similar but much smaller engine of 25.4 liters. 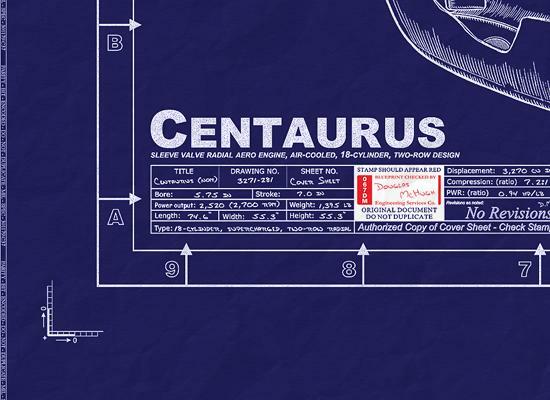 The latest type is the Centaurus, an eighteen-cylinder development of the Hercules. After the most thorough endurance and overload testing, which make up many thousands of hours on the dynamometer and in flight, and nearly six years of operational service in the Royal Air Force, Bristol sleeve-valve aero-engines have now definitely achieved a leading position. Externally, the most impressive characteristics of these engines is the extreme cleanness and simplicity, which is the result of the entire absence of outside valve-gear, together with valve-maintenance routine. 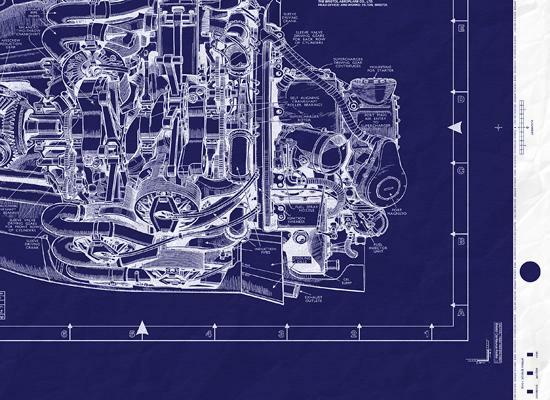 All Bristol sleeve-valve engines have high-speed, centrifugal, gear-driven superchargers, either single or two-speed. The supercharger is associated with a carburetor of the latest fully automatic type, incorporating variable-datum servo devices for the control of both boost-pressure and mixture strength. Later production types employ pressure injection carburetors enabling a closer control of mixture strength under varying conditions and greater freedom from ice formation. An installation feature of great importance is the arrangement of engine-driven accessories. The crankcase rear cover carries only those accessories which serve the engine unit itself, namely the engine oil pump, the dual fuel pump, the magnetos and the constant-speed airscrew governor unit. All other accessories are carried by a separate accessory gear-box mounted on the bulkhead and driven by the engine through an enclosed flexibly-jointed shaft. Several alternative arrangements of the gear-box drives are available to provide for the full range of accessories involved in modern aircraft equipment. This arrangement considerably simplifies installation work, and also lends itself to the adoption of standardized, interchangeable power units - a policy long recommended by the Bristol Company. Originally type-tested in 1938, the Centaurus is capable of further development well beyond the present nominal power of 2,500 h.p. for take-off. With a swept volume of 53.6 liters, it has nearly 40% greater cylinder capacity than the Hercules although the overall diameter is only just over 6% greater. Centaurus Series CE.22 SM: This engine is a forward development of the Centaurus XVIII and 57 Series and is the prototype of the Centaurus 130 which will power the Airspeed Ambassador and other British civil transport aircraft. The Centaurus 57 has a maximum power rating on 130 grade fuel of 2,475 h.p. for take-off, 2,560 h.p. at 4,250 ft. (1,300 m.) and 2,300 h.p. at 17,000 ft. (5,185 m.). With methanol-water injection the take-off power is increased to 2,800 h.p. and a corresponding increase is available for emergency level flight. The Centaurus CE.22 SM, although type-tested initially at a rating corresponding to that of the 57, is designed for immediate development to 3,500 h.p. It has a single-stage two-speed supercharger and direct fuel-injection. The Centaurus 130 will normally have a single-stage supercharger but the two-speed version will be available, and the engine is designed to facilitate the application of other developments in supercharging and fuel systems. The airscrew reduction gear will be suitable for reversing airscrews and an alternative reduction gear can be provided for counter-rotating airscrews if required. Particular attention has been paid to obtaining the cleanest possible cowl lines, both externally and internally, and with this object a rear-swept exhaust system of individual pipes has been introduced, thereby doing away with the parasitic drag of the conventional large external exhaust manifold. The nose cowl has been designed to reduce entry loss to a minimum and the airscrew spinner line is carried rearward to the cylinder base by means of a fairing over the reduction gear, so as to permit the use of a cooling-fan if required. In accordance with Bristol practice, provision is made to drive a number of aircraft accessories by means of a separate gear-box of varying capacity. Type - Eighteen-cylinder two-row air-cooled sleeve-valve radial with two-speed supercharger. Cylinder Assembly - Bore 5.75 in. (146 m/m. ), Stroke 7 in. (178 m/m. ), Swept Volume 3,270 cu. in. (53.6 liters). Open-ended barrels, with deep closely-pitched fins, machined from solid. Each barrel retained by sixteen large-diameter securing studs, the nuts for which are locked by spring locking plates. Cylinder heads of two-piece type, with screwed-in spark plug adaptors and provision for fitting of thermocouples. Sleeve and Sleeve Drive - Nitrided steel sleeve with four ports to admit and expel charge as they register with corresponding ports in cylinder barrel. Sleeves driven at half engine speed by system of cranks and gears off forward end of main crankshaft. Each sleeve provided, at its lower end, with a spherically-seated phosphor-bronze bearing in which crankpin of sleeve drive is free to slide and rotate. Ball bearings for sleeve cranks housed seven in each front and center section of crankcase. Pressure-lubricated sleeve crank journals and ball-joints. Sludge trap in hollow crankpins. Pistons - Each piston is fitted with two wedge-section gas rings, a channel section scraper-ring, and a normal type bottom scraper ring. Fully-floating gudgeon pins retained by circlips. Crankcase - The main case is in three sections of forged aluminum-alloy. The front, center and rear sections are bolted together, the joints being on the vertical center-line of the cylinders. The bolts for the rear section are made long enough also to secure the blower casing. Each section carries a housing for a crankshaft main bearing, and the front and rear sections also contain roller bearings for the front and rear sleeve-cranks. These sections also carry the sleeve crank gear-trains for their respective cylinder banks. The front cover encloses the front bank sleeve-drive mechanism, carrying nine plain bearings for the forward ends of the sleeve cranks, and locating the three layshafts for the intermediate wheels of the sleeve crank gear-trains. A pressure oil supply to the sleeve cranks is provided through integral passages to the plain bearings. A crankshaft main bearing of the parellel roller-type is fitted in the center bore of the casting. An airscrew constant-speed unit is mounted at the top of the front cover, and driven through an auxiliary gear train off the sleeve-crank wheels. Oil passages drilled in the casting supply oil to the unit, and also lead the high-pressure delivery oil to the reduction-gear case. The rear cover carries drives for the magnetos and auxiliary drive. The starter, which is arranged in a vertical position, drives the crankshaft through bevel gears. An auxiliary-drive facing to supply power for a separate accessory gearbox is provided and has a capacity of 30 h.p. Crankshaft - Built-up in three sections, the front and rear portions being attached to the center section by maneton joints, each secured by two bolts. The shaft runs in three high-capacity main bearings of the spherical roller, self-aligning pattern. Shrunk on to the two crankpins are white-metalled sleeves which form the big-end bearings. They are lubricated by pressure oil through drilled passages in the crankshaft. Each of the two balance weights contain two vibrations damping units of the Salomon pattern. Three oil jets are also provided in the crankshaft, one in each balance-weight and one in the center section. This latter sprays oil on to the center main bearing, while the other two lubricate the pistons and sleeves of their respective cylinder banks. Connecting Rods - An articulated connecting-rod system is employed for each bank of cylinders. Pressure lubrication of the wrist-pin bearings is provided through an oil retainer, while the small ends are supplied by splash lubrication and the balance-weight oil jets. Oil retainers are fitted at each side of the big-end assemblies to control the rate of leakage and to ensure that full oil pressure is maintained in the bearings. Reduction Gear - Epicyclic bevel unit with a ratio of 0.44 to 1. Power from the crankshaft is transmitted to the rear bevel wheel through a toothed coupling, and the wheel is positioned by a ball thrust-bearing located in a spherical seating. The airscrew shaft has three trunnion arms, which carry the bevel pinions. Lead bronze bushes are pressed into the bores of the pinions and longitudinal location is achieved by ball thrust-bearings secured on the ends of the trunnion arms. The front bevel wheel is stationary, being secured to the reduction gear case by a toothed coupling, and located on a spherical seating. As both front and rear wheels are able to tip slightly, the load is distributed evenly over the three pinions regardless of manufacturing tolerances. The airscrew shaft runs on two bearings, the rear comprising a lead-bronze sleeve pressed into the end of the crankshaft, and the front a large ball bearing which also takes airscrew thrust. An oil transfer sleeve is arranged on the airscrew shaft to transmit oil from the constant-speed unit to the airscrew through the hollow forward end of the shaft. The supercharger gear-ratio control valve is located in the top of the crankcase rear cover and is supplied, and delivers, through internal oil passages in the casting. Supercharger - The centrifugal supercharger uses a double-shrouded light alloy impeller which is carried on a shaft supported by two ball bearings, of which the front is self-aligning and the rear of normal pattern. Two blower gear ratios available, selection being by two compound hydraulic clutches. The oil for clutch actuation passes through two centrifuges. The units are located at the top of the blower casing and are readily accessible for cleaning. The clutches are driven by a spring-drive gear on the crankshaft, this unit protecting the drive from cyclic torque variations. Oil Sump - The oil sump is a large capacity casting bolted on to the underside of the supercharger. It has an easily accessible oil filter, and carries the petrol and oil pumps which are driven by shafts powered from the rear-cover gear trains. This arrangement ensures that the scavenge oil pump is always submerged. A small gear-driven scavenge oil pump is fitted in the base of the front cover casting and is driven off the sleeve-crank train. Its purpose is to remove surplus oil from the forward end of the engine, and return it to the sump through an external pipe. Construction: 3-piece forged aluminum alloy crankcase. Cylinders with forged aluminum alloy barrels, and composite steel and copper heads. 3 inlet ports and 2 exhaust ports around mid-section of cylinder barrels. 1 stainless steel reciprocating and oscillating single-sleeve valve per cylinder, with 2 inlet ports and 1 exhaust port, and 1 port alternately inlet and exhaust. 2-throw 3-piece crankshaft supported in 4 roller bearings. Epicyclic bevel reduction gear, ratio 0.40:1. Torque-meter. Provision for constant speed, feathering and reversing propeller. Supercharger: Gear-driven 1-speed supercharger, with 2 epicyclic driving units, ratio 5.25:1. Double shrouded impeller. 2 horizontal intakes. Fuel system: 1 Hobson-R.A.E. B1/BC20M horizontal injection type carburetor, with injection through 2 nozzles, 1 in each intake. Automatic boost control. Equipped for water injection. Ignition: 2 A.E.I. CGE/1 low-tension generators mounted on rear cover supplying 2 A.E.I. CD18E/2 high-tension transformers and distributors mounted on front cover. 36 14-mm spark plugs. Lubrication: Pressure feed, 100 psi (7,0 kg/cm2). Dry sump. Starter: Rotax C.3006/1 electric starter. Centaurus 18: Military engine. 2-speed supercharger. 2,470 hp/2,700 rpm.